Le Pen and Macron have emerged as the top two vote-getters in the first round of the French election. The outcome marks the first time that none of the major French parties has emerged as a winner–the repudiation of politics as usual is obvious in the outcome. But the two are also quite different in their politics. Le Pen’s populism hardly accords with the pro-EU centrism of Macron. 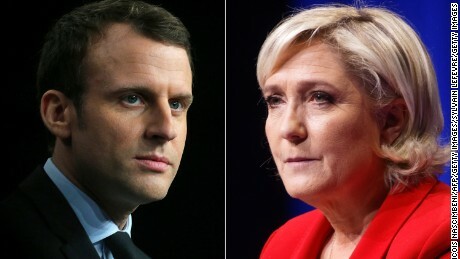 Most analysts believe that Macron will win the second round on 7 May and, if that is the case, the outcome will replicate the earlier elections in Austria and the Netherlands where the right-wing parties did not succeed in obtaining majorities. Income inequality has important political consequences. In 1970, the US middle class (defined as those families of three with incomes between about $42,000 to $126,000 annually in 2014 dollars) shrank from about 61% in 1970 to about 50% in 2015. This loss of status and security leads to resentment and fear which then become the fodder for politicians. The rise in more authoritarian politics in the world, in the US, Europe, and in Asia) can be traced to this loss of societal position. 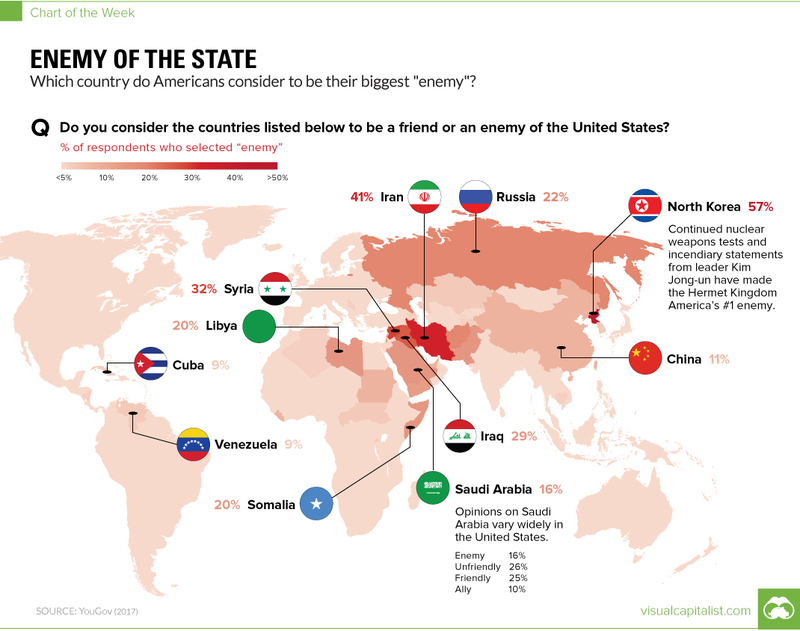 Visual Capitalist has a very interesting graphic showing which countries in the world most Americans regard as an “enemy”. The data for the graphic comes from a survey taken by YouGov between January 28 – February 1, 2017. According to that poll, no American regards Madagascar, Paraguay, or Australia as an enemy (1% consider Canada to be an enemy).